The focus of First Christian Church (Disciples of Christ) is community - meaning we care for each other and minister to those in our area without any “strings” - that we may fulfill the mission of Christ. We are a diverse congregation, comfortable with our differences in opinion while united by a common sense of purpose and with a like-heartedness that naturally expands our circle of friends. You may have driven by and seen our sign on Todds Lane, otherwise known as "God's Way" with all the houses of faith along its length. Rooted in the Hampton/Newport News area since 1888, First Christian has been at our location since 1961, in a 1-story building with fully accessible entries, sanctuary, classrooms, fellowship hall, and restrooms, for the disabled. Most park in the lots to the rear of the sanctuary, but there is also plenty in front! The learning hour begins on Sundays at 9:30 a.m., with groups for all ages, with worship following at 10:45 a.m. Some wear "Sunday clothes" and others dress casually; the point is that we enjoy being with one another and welcome strangers with as much joy. Worship services are, as well as the music, a mix of traditional and contemporary. Strong choirs and solid preaching, and the Lord’s Supper open to all. The pastor likes to keep it short to a 12-15 minute sermon and posts his sermons for those unable to attend or who just want to go back and think more about what was said. Children are are highly welcomed in worship. For those with health issues or little ones, there is an ADA-compliant "family-style" restroom is just off the sanctuary. A nursery is available upon request for babies and pre-schoolers, with all workers trained and background-checked. You will find we are a congregation committed to volunteer service, whether in supporting worship and education, or the two dozen who support our weekly "The Welcome Table" feeding ministry. Service to others defines us and has changed us. Likewise, we actively host 15 helping and social community organizations, ranging from multiple Girl Scout troops, to AA and Al-Anon, as well as onoging support to local elementary and middle schools. If you have questions or need more information, please call the church office at (757) 826-0711. You can also check us out on social media, or just stop by the church. Office Hours: Monday through Thursday, 9 AM - 2 PM. If you need to make an appointment outside those hours, call to make arrangements with the pastor. Page 1. 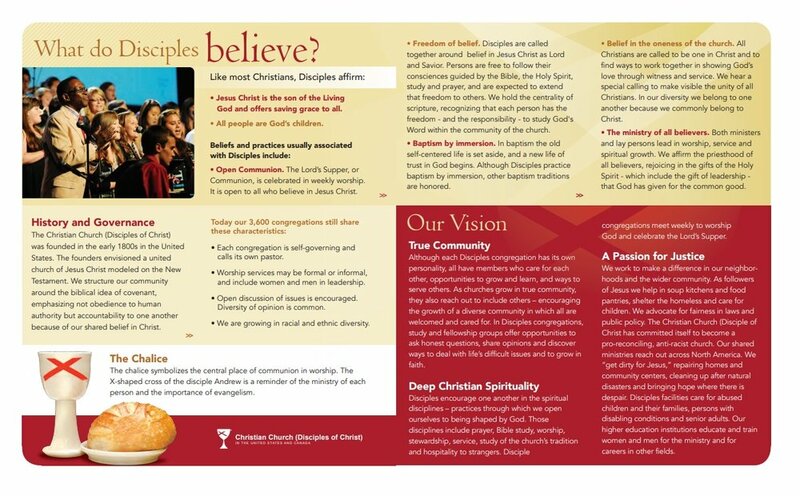 Click on image and it will take you to a readable image on the church Facebook page, if you would like to know who we are as Disciples of Christ. Page 2. Click on image and it will take you to readable image on the church Facebook page, if you would like to know who we are as Disciples of Christ.